The Sierra Nevada Mountains stretch from Tehachapi in the south to Lake Tahoe in the north. Highlight include milky glacial lakes, wildflower meadows, giant sequoia groves, roaring waterfalls, and Mount Whitney, the tallest peak in the 48 contiguous United States. 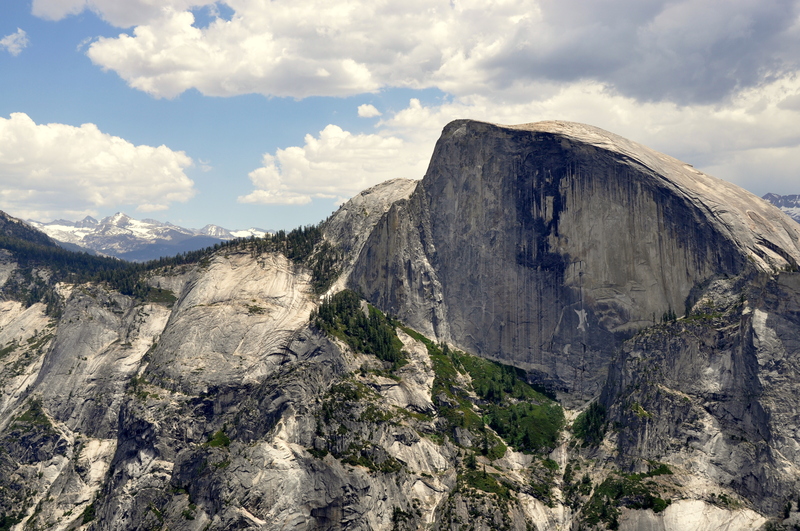 For photographers, though, the single highlight may be Yosemite’s Half Dome, the 8,842-foot (2,695-meter) limestone rock formation in the picture above. 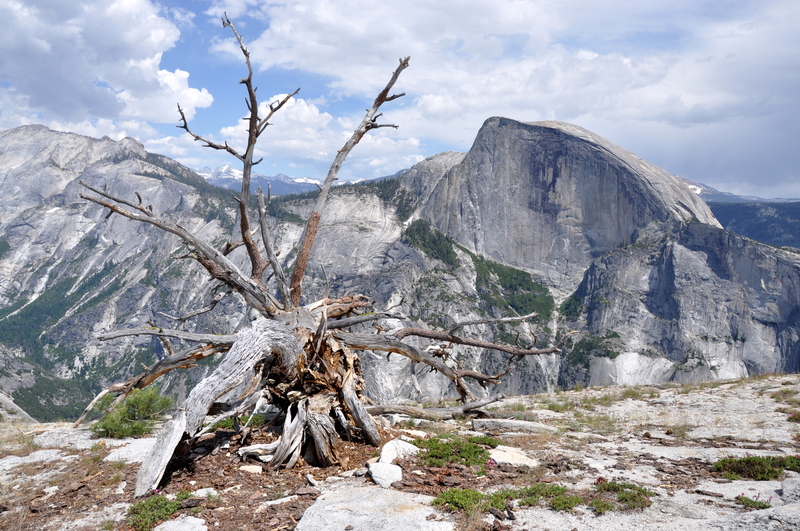 The photo above, which captures Half Dome, a fallen birch, and distant back country peaks, was taken from North Dome, separated by Half Dome by Mirror Lake (not pictured) and 1,300 feet lower in elevation, although the perspective makes it seem as if we are gazing down upon Half Dome. I hiked 17 miles from the Valley floor to the Half Dome summit in 2002. I cannot find pictures from the climb itself, but note that the final approach, up the curved backside of Half Dome, involves a scramble up a pair of precipitous cables where, at its steepest, the grade is perhaps 75%. Today, a permit lottery has cut down on trail crowding, and I would love to one day return with a proper DSLR camera. 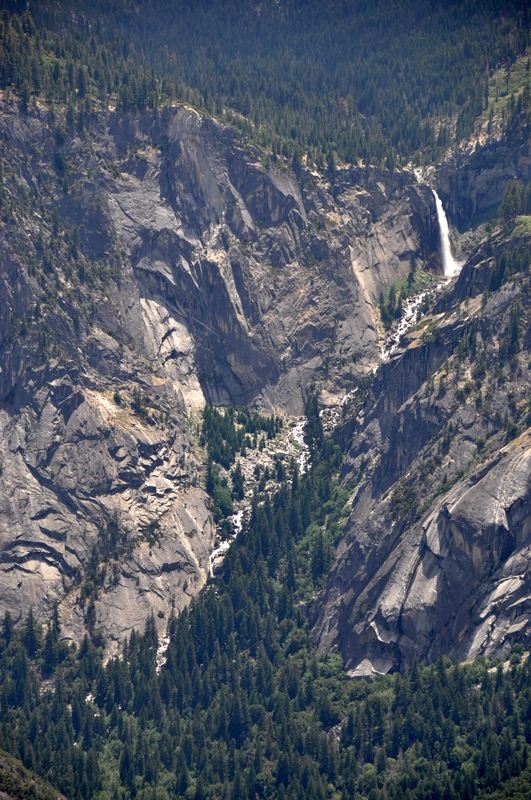 Incidentally, the waterfall above, Nevada Falls (as seen from North Dome), is one of two that hiker pass en route to the summit, and the spray is wonderfully refreshing on a hot summer day. 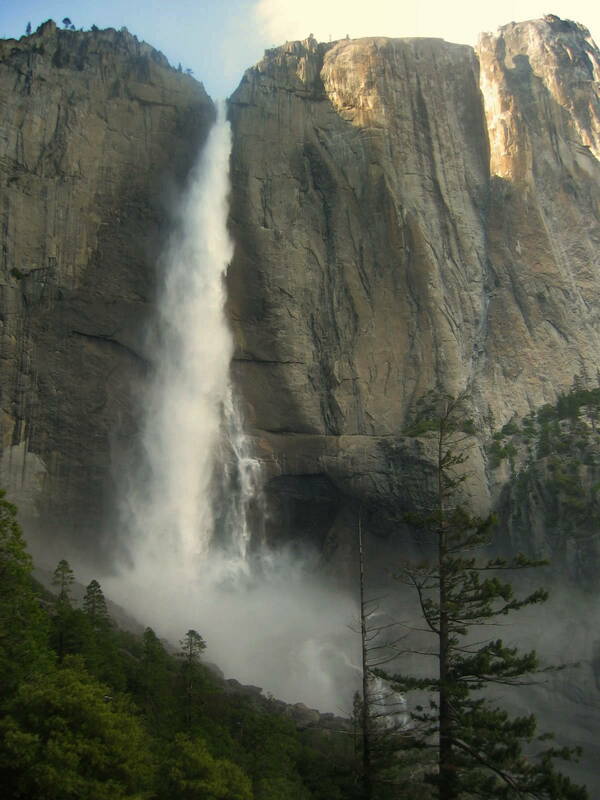 Speaking of waterfalls, behold the uppermost cascade of Yosemite Falls, at 2,425 feet (739 meters) the tallest waterfall in North America. 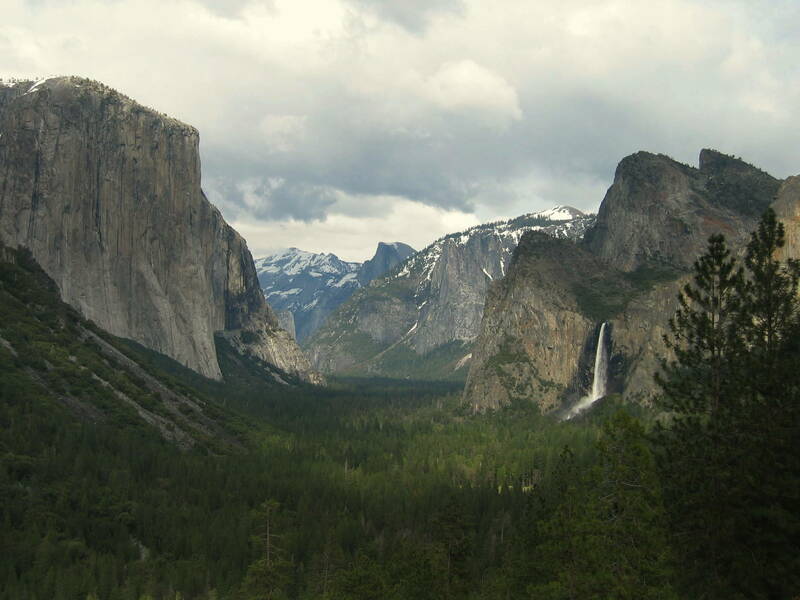 The back country of Yosemite is home to over 800 miles of trails, and while many of them start off of scenic Tioga Road, the crowds typically disappear once you’ve hiked more than two miles from the trailhead. 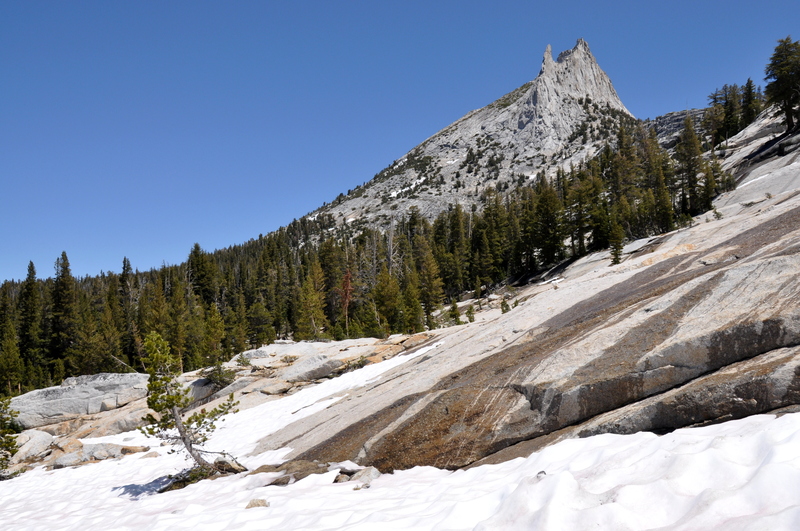 The picture above is of craggy Cathedral Peak as seen from the shoreline of Cathedral Lake. Yes, that is snow in the foreground, all the more remarkable considering that this picture was taken in July! 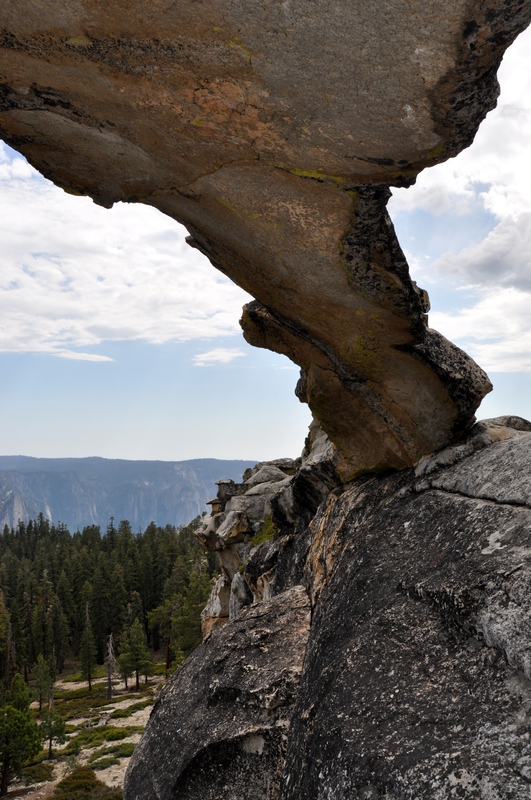 Another jewel of Yosemite’s back country: Indian Rock. I won’t tell you where this one is specifically, as I want to keep it from being “ruined” by over-hiking. That being said, I like how the flash illuminated the underside of the natural rock arch. If you follow the Tioga Road east, it ends at Highway 395, which connects Lake Tahoe in the north with Mojave in the distant south. 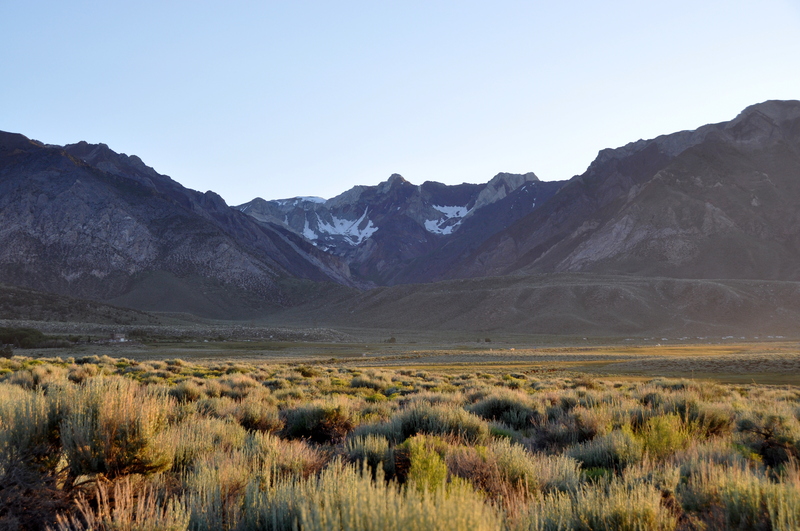 Views to the west as you drive along 395 are often jaw-dropping, such as this just-before-sunset capture of the Eastern Sierra near Crowley Lake. Arguably the most bustling town along 395 is Mammoth Lakes, a skiing destination in winter and a mountain biker’s mecca in summer. 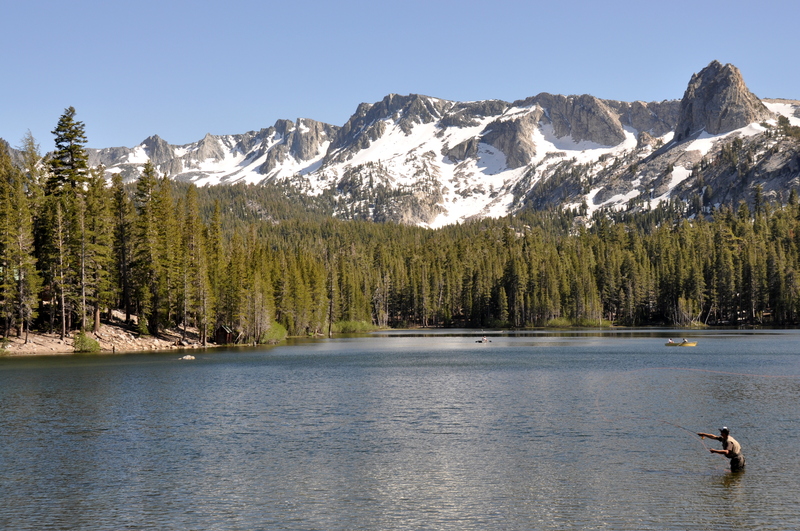 The picture above is of the High Sierra as taken from the shore of Lake Mamie, one of several pristine sub-alpine lakes for anglers in the region. 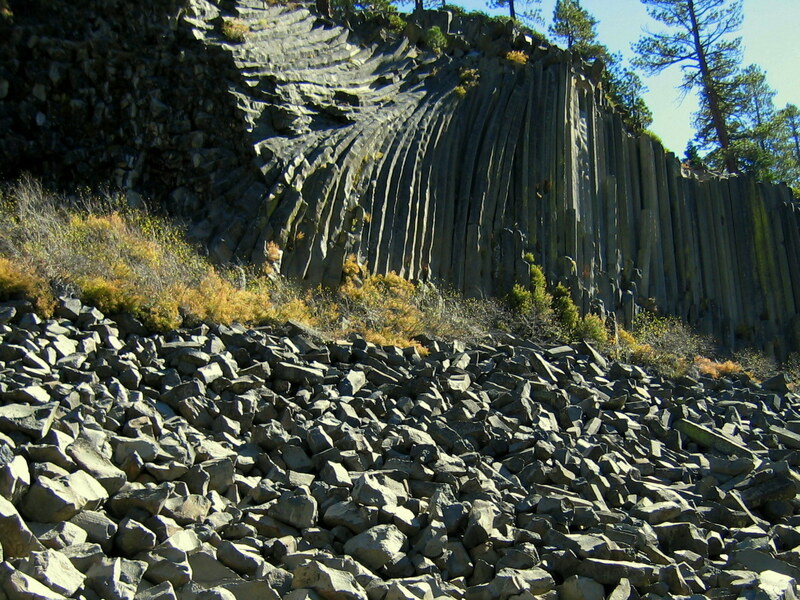 Devil’s Postpile National Monument is a tiny blip on the NPS map south of Yosemite National Park. The “postpile” in question, above, is a cluster of hexagonal basalt columns similar to the Prismas Basalticos near Pachuca, Mexico. 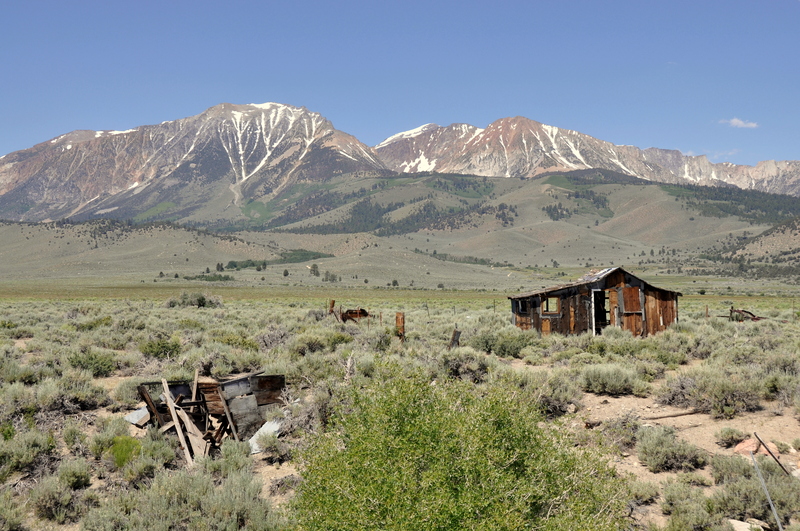 Above is another picture of the Eastern Sierra as seen from Highway 395…and a reminder that much of California is a desert. Not only is the scenery more lush as you enter the heart of these national parks and forests, but wildlife sightings are more common. 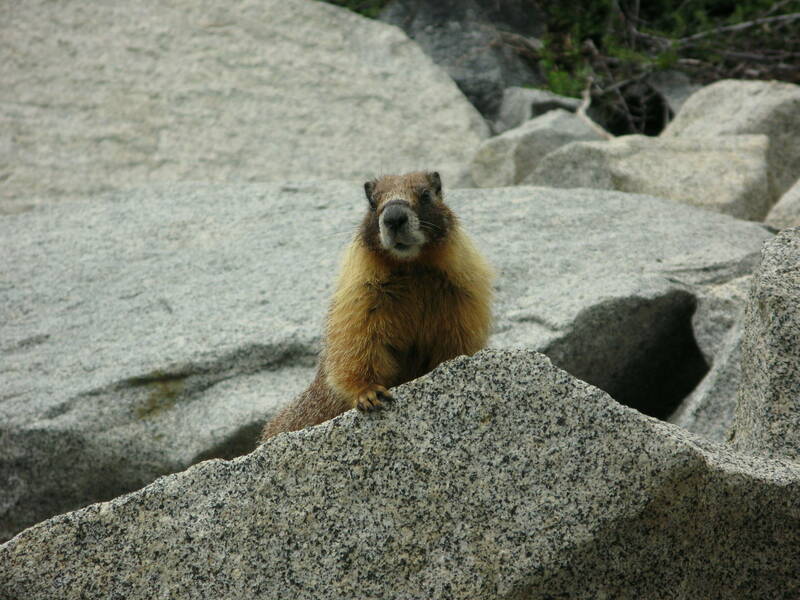 This cute fella, one of several marmots that I’ve seen in Sequoia National Park, was hanging out near a popular picnic spot, hoping for a free lunch. Watch your car – marmots have been known to chew through radiator hoses! A single road, Generals Highway, passes through the park from south to north. 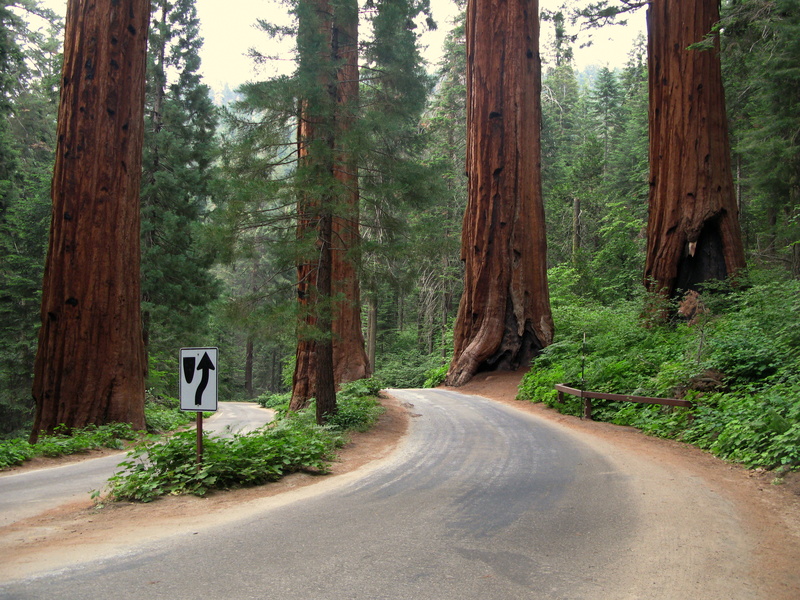 Sequoia National Park becomes Kings Canyon National Park perhaps two thirds of the way along the road. The majority of the most-visited landmarks at each park are no more than two miles off this road. 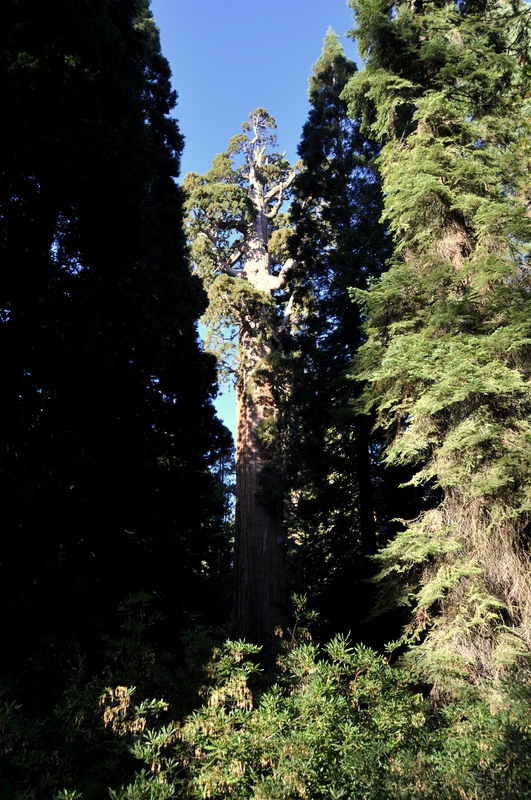 The General Grant Grove of giant sequoias is even closer, and the road had to be paved around these magnificent trees to protect them. 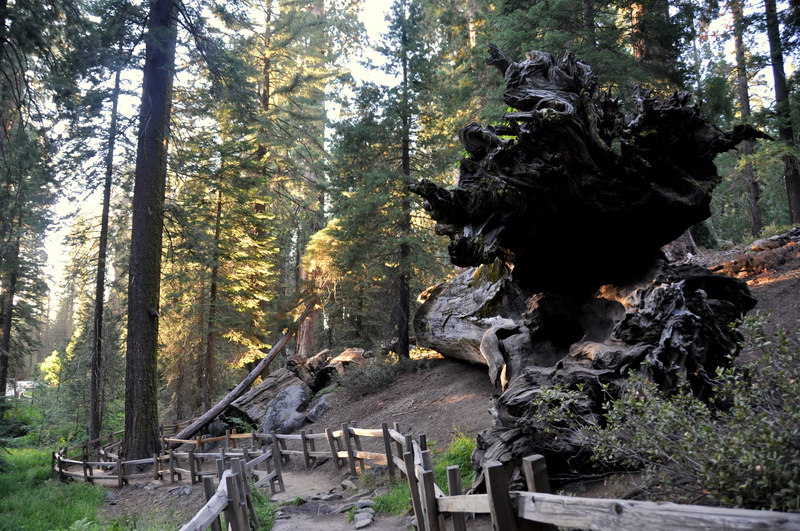 As the fenceline in the picture above suggests, the trunk of the fallen behemoth is wider than a human is tall. 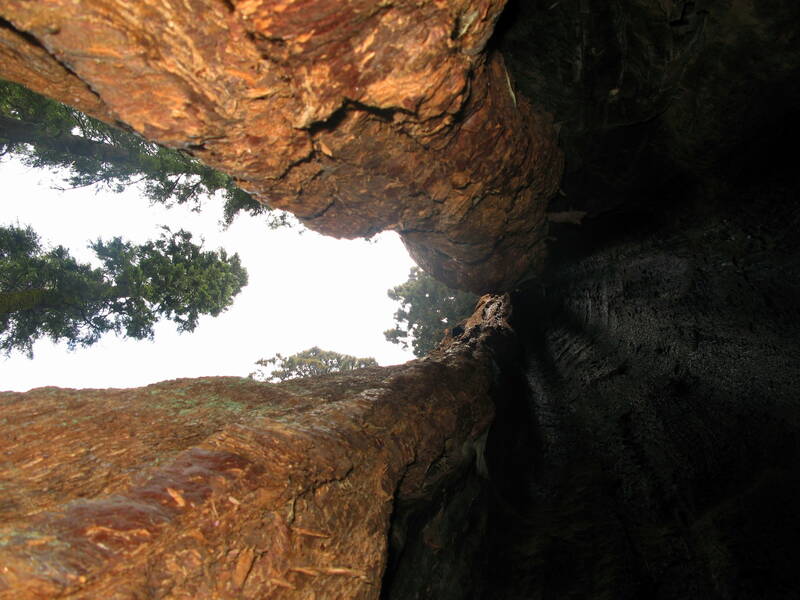 Giant sequoias are the largest living things on earth, and impossible to photograph in full unless from afar. The sentinel in the center of the picture above is the General Grant Tree, known as “the nation’s Christmas tree.” I am told that visitors can snowshoe through the grove during the winter months. Just looking at the picture above makes me dizzy! Above, the Four Guardsmen stand watch over thru-traffic along Generals Highway. These trees are thousands of years old. 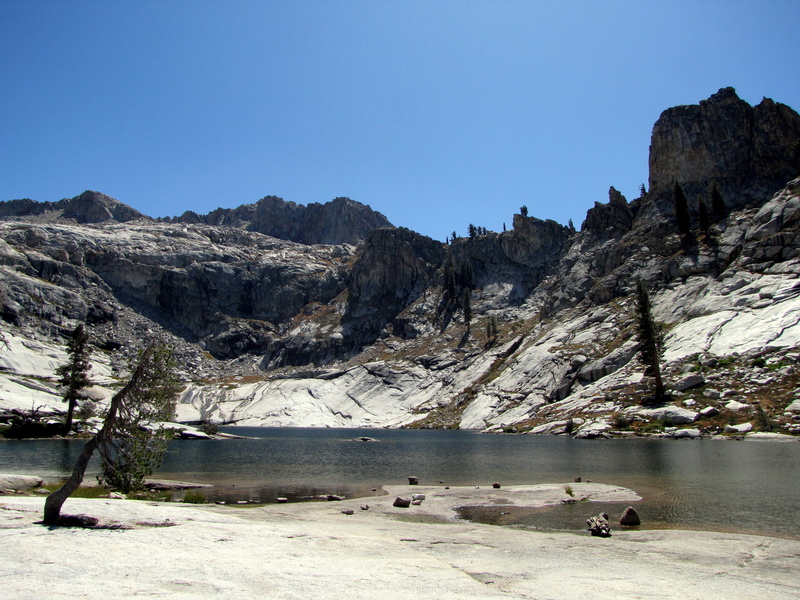 It is a four-day hike from west to east across rugged country if you get lost in the park’s back country, and you’ll eventually find yourself passing above treeline as you approach the series of 13 and 14,000-foot peaks (including Mount Whitney) that comprise the eastern border of these adjacent parks. 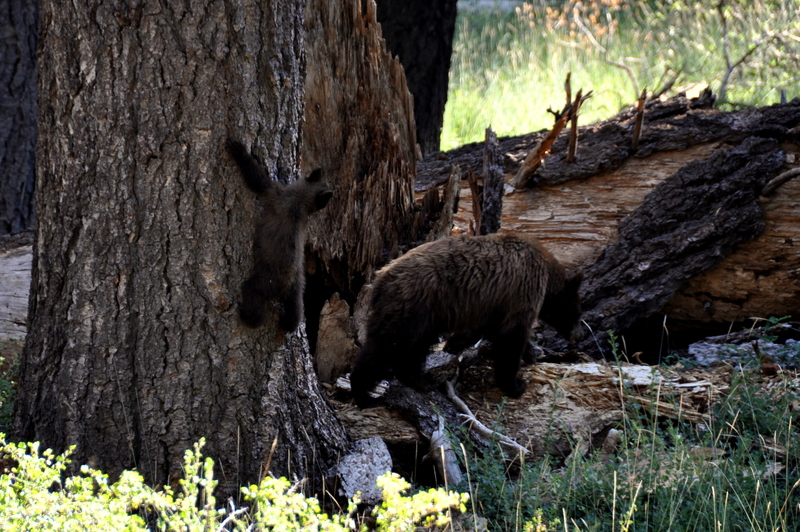 Mama and Baby Ursus Americanus (American black bear) don’t seem daunted in the least. Pear Lake, some 9,280 feet (2,829 meters) above sea level and one of the jewels of the back country.